The underdeveloped, sparsely populated Russian Far East has historically represented the paradox of Russia’s identity, and involvement, in Asia: Geographically, Russia is very much a part of Asia, yet its development economically and politically over centuries has been unmistakably Euro-centric. 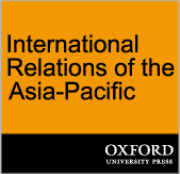 As a result, it is no accident that many Asian countries have viewed Russia as a “distant neighbor,” as Tsuneo Akaha writes in the lead article of our cover package on Russia in Asia. That is poised to change dramatically. Russia is pouring billions of dollars into the Russian Far East as part of a grand strategy to embed Russia more firmly into the dynamic economies of Asia. This ambitious turn Eastward also has the potential to provide Russia a voice at the table as Asian nations continue to build mechanisms for greater integration and co-operation. So, too, does it promise to alter the calculations of great power rivalry in Asia, which have so often focused on the rise of China, the impact this will have on the role of the US as the current hegemon, and the evolution of a new security architecture in the region. Understandably, the appeal of Russia’s reinvigorated interest in Asia to other Asian nations — especially to Japan and South Korea — is keenly tied to the ability of the natural-resources rich Siberia and the Russian Far East to provide valuable commodities such as oil and gas with less uncertainty than the Middle East. At the same time, Russia’s dependence on its natural resources for economic growth and fiscal revenues is in itself a challenge to authorities in Moscow who recognize the need to modernize the economy in ways that diversify the country’s economic foundations. Here, too, President Vladimir Putin’s plans for Siberia and the Russian Far East envision more than just pipelines for oil and gas, but also infrastructure such as additional railways that will enable Russia to tap into Asia’s vast pipeline of trade in goods. 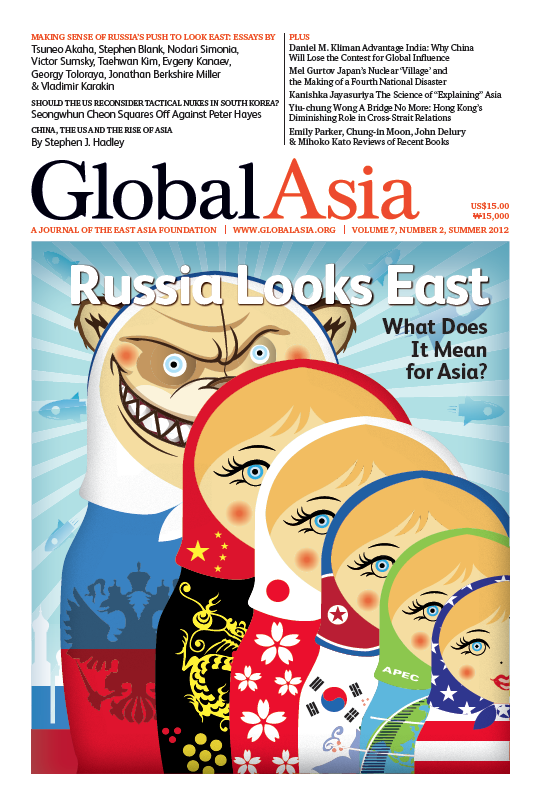 In the cover articles of this issue of Global Asia, we explore both the promises and the perils of Russia’s new embrace of Asia. We do so ahead of the summit in Vladivostok Sept. 7-8 of the Asia Pacific Economic Cooperation (APEC) forum, where the Russian government will surely be eager to showcase its commitment to a deeper engagement with the region. Elsewhere in this edition, we dissect the state of Sino-Indian relations; explore whether the Indian or the Chinese model of development will eventually prevail; ask whether Hong Kong’s role as a bridge in cross-straits relations with Taiwan are over; look at the sources of political instability in Vietnam; examine shortcomings in how Asia is studied in existing models of social science; lament the continuing dominance in Japan of the “nuclear village” formed by government and the nuclear industry; and revisit US-China relations. And, as usual, we point you to books on Asia we believe you should read. And finally, we debate whether the US should consider redeploying tactical nukes to South Korea. 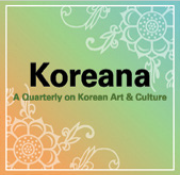 With this issue, we are also delighted to announce that Prof. Yoshihide Soeya of Keio University, Tokyo, and Dr. Wonhyuk Lim of the Korea Development Institute have joined the editorial board of Global Asia. Long thought of as a ‘distant neighbor’ by Asian nations, Russia under the leadership of President Vladimir Putin is engaged in an effort to turn the country Eastward to engage Asia’s fast-growing economies. The move presents great opportunities to the region, but could also reshape the geopolitics of Asia. Does Moscow have a realistic strategy for taking advantage of its Asian neighbors’ economic dynamism by expanding bilateral political relations and becoming part of the development of multilateral co-operation and integration in East Asia? Russia's call for a multipolar world, where power doesn't reside with a single hegemon such as the US, is a veiled bid to exert Russian influence in Asia and the world at a time when Russia's great power status is questionable, at best. Nodari Simonia and Victor Sumsky delve into the complex politics and economics of Putin’s bold strategy to turn Russia toward the East. Can Putin Go Beyond Putinism, or Will It Be More of the Same? As Vladimir Putin begins his third term as president of Russia, the country's economy, and even its political system, remains as dependent as ever on the export of natural resources. Russia's Arms Boom and Changing Priorities: Where Does Asia Stand? Until fairly recently, Russia's defense-industrial complex was targeting primarily external markets. Currently, the priority is shifting towards rearmament and the modernization of Russia’s own Armed Forces. The Korean peninsula is playing a significant role in Russia’s ability to realize its ambitious goal of becoming a truly Euro-Pacific power. There are numerous reasons for Japan and Russia to build a closer strategic partnership in light of issues ranging from the rise of China to energy, transnational crime and North Korea's nuclear program. Due to the decline of industrial activity after the Soviet Union collapsed, the Northeast Asia region has been spared significant environmental damage, but the future is far from assured. Should the US Consider Redeploying Tactical Nukes in South Korea? For more than two decades now, South Koreans have watched as negotiations repeatedly failed to end North Korea's development of nuclear weapons. Redeploying US tactical nukes would change the strategic dynamics entirely and at last enable a breakthrough. Frustration at North Korea fuelled a recent attempt by US lawmakers to secure support to redeploy US nukes in South Korea. But the plan is out of touch with political and military realities, and it runs the grave risk of making the situation worse. In a speech delivered recently in Seoul, former US National Security Advisor Stephen J. Hadley outlined how the remarkable economic rise of Asia has reshaped the global political order and how this has posed trenchant questions. 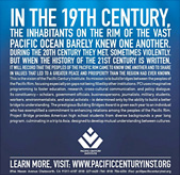 What is needed is a new approach that frees “Asian studies” from the constraints that marginalize the topic from mainstream academic discourse and repositions it as part of a new global social science. Many see China's authoritarian government as an asset in its rise up the economic ladder, but India's more open and transparent democracy gives it the edge when it comes to becoming a global power. As Japan contemplates the future of nuclear energy in the country, the pro-nuclear government and the nuclear industry risk submitting the country to yet a fourth disaster. With relations between Mainland China and Taiwan warming quickly in recent years, and China asserting greater control over Hong Kong-Taiwan relations, Hong Kong's bridging role may no longer be as important. Former BBC correspondent Angus Roxburgh's The Strongman: Vladimir Putin and the Struggle for Russia dissects Putin's remarkable emergence and his administration's inner workings. Reviewed by Emily Parker. Short Reviews of Pakistan on the Brink: The Future of America, Pakistan and Afghanistan by Ahmed Rashid; No One's World: The West, The Rising Rest, and the Coming Global Turn by Charles A. Kupchan, etc.